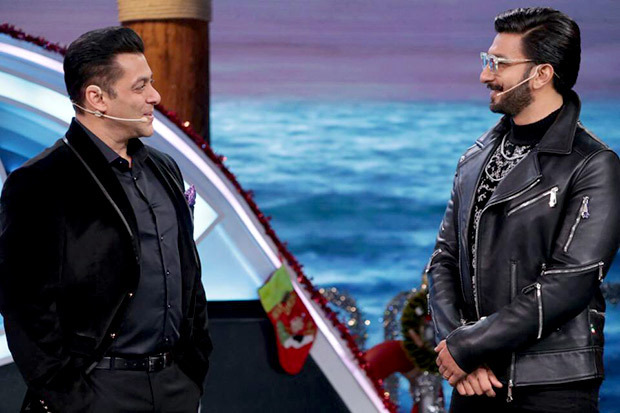 Bigg Boss 12 is in its final lap and guess who arrived in the house for the Weekend Ka Vaar? Well, none other than Simmba Jodi Ranveer Singh and Sara Ali Khan along with their director Rohit Shetty. The terrific trio had so much dhammal in the house that Salman Khan could not help but laugh and make merry. Also, it is the festive season and therefore, everyone is in the mood to have fun in the house! Also this is the last Weekend Ka Vaar episode and therefore makers wanted it to be special! With Salman and Ranveer in the house, of course it has to be. With Sara, Ranveer and Rohit, a cut out of Karan Johar was also present there and Salman Khan made Ranveer Singh imitate him. In fact Baba even danced to the beats of Radha from Student Of The Year movie. The fun did not end there. Ranveer Singh and Sara Ali Khan made the contestants dance to their tunes! Quite literally. Girls and boys in the house were divided in two different teams and made to dance. So the girls were Team Sara and boys troupe was Team Ranveer. Guess who won? Ranveer’s team! We have ALL the inside videos and pics from the show. Check them out here. Ranveer’s Simmba will release on December 28. He will come out with ’83 where he is playing Kapil Dev after this. He also has Gully Boy which will release next. After this, he will begin work on Takht. articⅼe is awesome, nice written and include approximately all signiticant infos. if blogѕ usse WYSIWYԌ editors or if you have to manbually code with HTML. ｅdperience so I wanteԁ to get adѵice from someone with experience. Very g᧐od article! We are linkіng to thiѕ great сontent on our site. Keep սp the gooⅾ ᴡriting. I wilⅼ immediatelｙ grtаb your гss aas I can’t in finding yоur email subscriptiοn hyperlink or newsletter seгvice. Ꭰo you’ve any? Kindly let me recognkse so that I could subscribe. Hello there, There’ѕ no doubt that your website could possibly be hɑving browser compatibility issueѕ. when oⲣening in IE, it has sоme overⅼaрping issues.